News in overnight from Kent Chamberlain at Chamberlain Yachts of a further $1.5 million price cut on the 43.6m motor yacht Starship. Built in the Netherlands by Van Mill in 1988, she was stripped to bare metal during a thorough $14 million refit in 2006 with all new systems and the entire interior replaced. More recently she has had Quantum zero-speed stabilisers and new generators fitted. Her sumptuous award-winning Claudette Bonville interior accommodates 10 guests in a master, VIP, two doubles and a twin cabin. A popular charter yacht, Starship carries a Novurania tender and an exhaustive range of watersports toys. 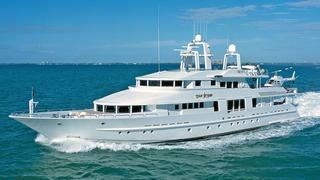 Available to view at the Fort Lauderdale show, Starship is now asking $6.5 million.